Food Costs > How Much Does Calamari Cost? How Much Does Calamari Cost? Calamari, also known as “Squid” or “Fried Squid,” is a popular dish that comes from the Mediterranean. This squid is generally deep fried and is served as an appetizer at many Italian and seafood restaurants. Many restaurants tend to use their own spices when it comes to deep frying it, so the taste may vary from restaurant to restaurant. Common sauces that are served with calamari include tartar sauce, cocktail sauce, and signature sauces. The cost of calamari is going to depend on the restaurant to which you are going, how much you want and the time of the year. At most restaurants, this appetizer is going to range anywhere from $5.50 to as much as $18 at your higher end restaurants. A higher end restaurant in a city, such as New York, will charge a lot more than a franchise-based restaurant in Iowa. For example, Olive Garden charges around $10 for their calamari appetizer. Raw calamari steaks will cost anywhere from $6 to $12 per pound. These can usually be purchased at your local fishing markets or even online. To purchase calamari rings, the price will vary anywhere from $7 to $15 per pound. If you decide to purchase online, it will more than likely have to be shipped to your door within 24 hours. Calamari can also be purchased frozen. A 32-ounce box can cost $55 to $75, and eight to 18-ounce individual boxes can cost anywhere from $8 to $30 depending on the store you purchase it from. Most will pre-pack the squid to ensure that it holds its freshness. Calamari will generally be shrink-wrapped so that it can be thrown in the freezer to last longer. Some companies may prep the calamari. This will include the spices and it should already be battered in a shrink wrap. All you have to do is throw it in the oven or deep fryer. The meat is known to be firm, sweet and almost has a nuttier flavor. Squid, which is where the meat comes from, can size up to 80 feet, but most people will eat from squid less than 12 inches. Calamari can be bought from online seafood vendors, many grocery store chains, seafood markets and ethnic markets. Most fish markets online will ship to your home and will typically be at your door within 24 hours. Shipping costs can vary with most online merchants, especially if you don’t meet the minimum spending requirements. If you decide to cook a meal at home using Calamari, you will need additional ingredients such as the batter, a deep fryer, spices and a dipping sauce. Something such as Calamari can’t be cooked for a long time. If it’s cooked for too long, it will almost taste like rubber. Most state that two to three minutes on a high heat is more than enough. It can also be simmered in a tomato sauce to be paired with pasta. If you’re going to clean calamari, keep in mind that almost 50 percent of the body can’t be used. To prepare, the head, viscera, inner cartilage, the fins, skin and beak will all have to be removed. The only part of the squid that’s edible will be the tentacles and body. What is calamari? Calamari is a squid, and it’s usually, but not always, deep fried or battered. Known as the Italian word for squid, it’s usually made from European squid – a squid found in the Mediterranean, Adriatic sea and some parts of the Atlantic Ocean. 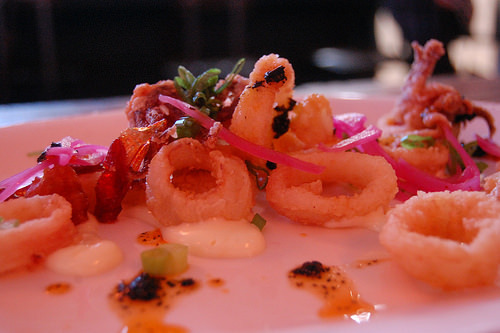 Calamari is usually prepared as an appetizer and is garnished with a lemon and parsley. Calamari dipping sauces can include marinara, an aioli, tartar sauce or flavored mayonnaise. Find a local fishing market in your hometown. By purchasing it locally, you will be able to save money on overnight shipping.